A progressive and independent recruitment consultancy, headed by Yvonne Jacobs, working together with you in the world of Audio Visual and Live Events, as well as in all aspects of Digital Media from Content Creation to Social Media Marketers. Having spent many years in this specialised technical sector, Yvonne is well known for her ability to match the person to the job - be it arranging the perfect Freelance Technician for that prestigious event or finding the organisation with an environment and culture that exactly suits the skills and personality of the Technician who is seeking out a new role. Following her lead, we at Digital Concrete are not in the business of just filling a quota: we listen to both the client’s and candidate’s requirements, discover what it is they are looking for, what they really need, so that the 'process' becomes a conversation, not simply a transaction. We focus on your organisation, your people, the environment and values, the culture and experiences of those already part of the company - which means the candidates we find don't just have the skills you need, but will also enjoy being a part of your team. They will be bringing, not only the knowledge and competence you are looking for, but contributing their dedication and curiosity, working with you, eager to help in your success, and to learn and grow with the business. From the moment you get in touch with us, we will listen. We want to talk to you, meet with you - to find out not just your capabilities in Live Events & Audio Visual, or your effective Digital Marketing skills, we want to discover what it is you need from a job, what you value, and how you hope to use & showcase your abilities within an organisation. For all of us, it is not just appreciation of our technical ability that we value but also where we work, the people we work with, the culture of the organisation; which can be just as important as the work we do. Here at Digital Concrete, we dedicate ourselves to placing people in positions that not only match their expertise, but are in the work environments & cultures that let them flourish. 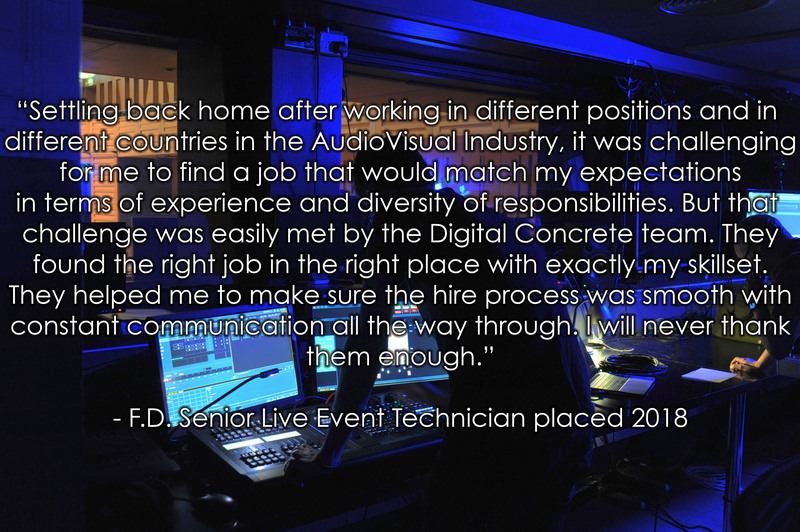 We supply Permanent Candidates, Contractors and Freelance Technicians, discovering those with the full range of skills needed in these specialised technical sectors - finding the perfect corporate 'White Glove' Video Conference and Audio Visual tech, seeking out the highly experienced Live Event professional, or the multi-skilled online Marketer you are looking for. We'll find those people - those at the grassroots & graduate levels, keen to put to use their technological know-how and eager to learn more, as well as the accomplished Project Managers and senior professionals. We focus on finding you the candidate who is not just capable & competent but is perfect for the team, bringing added value with both their technical skills and their personal qualities. With the technology rapidly evolving and the commercial environment ever changing, one thing is constant - the need for savvy & skilled talent to keep organisations competitive. We discover and represent those skilled technicians, the professionals & high achievers, the innovators, who enjoy keeping up with the technology and using it to make any event the best it could be; those who are proud to use their skills in the service of company & customer dynamics. 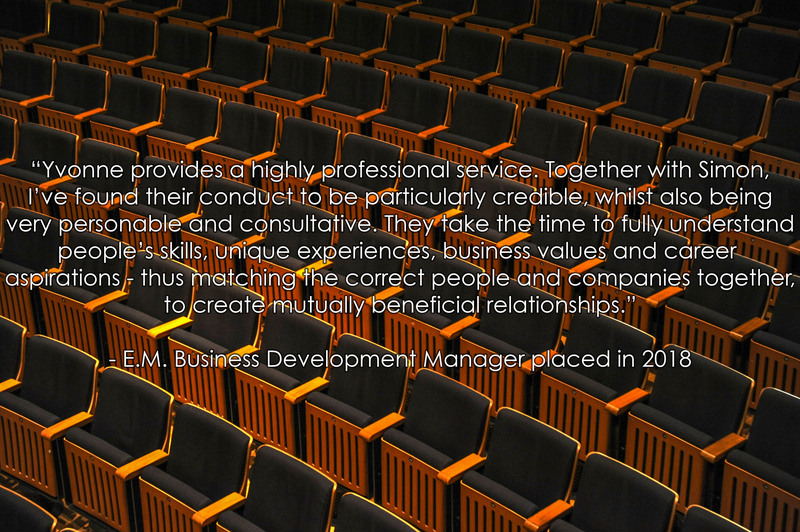 We are everything you should expect from an independent consultancy: accountable, autonomous, flexible and personable. The truth is, whatever the project, we answer your brief without ever losing sight of your practical, budgetary or commercial objectives.